Do you have slides and photos you've collected from field work or vacations? Every month, we'd like to feature one of your photos from anywhere in the world and invite other readers to guess where it was taken. Look every month in the print Geotimes for a new photo. Following are clues, answers and winners from past issues. Our rules will change, starting with the September Where on Earth? in the print Geotimes. All answers will be accepted until the 20th of the month, or the Monday just after it (including answers postmarked with that date). For example, answers to the September Where on Earth? will be accepted until Sept. 20. From those answers, Geotimes staff will draw the names of 10 people who will win Where on Earth? T-shirts. And from those 10 names, we will draw the names of two people who will win a Brunton compass. Click here to submit a guess for this month's Where on Earth? contest. Submit photos for Where on Earth? 1. This island was originally called Geanahani by the native Lucayan people. At one time the island was named after buccaneer George Watling but today is known by the name its first Italian visitor gave it. 2. The subaerial carbonates pictured here were probably deposited by shoaling during stormy periods when sediments blanketed a carbonate platform and progressively emerged into beach ridges and dunes. 3. During the lowstands of the Quaternary, differential weathering formed this structure. At the same time, rainwater dissolved blue holes and caves throughout the island, which is locally called a cay. 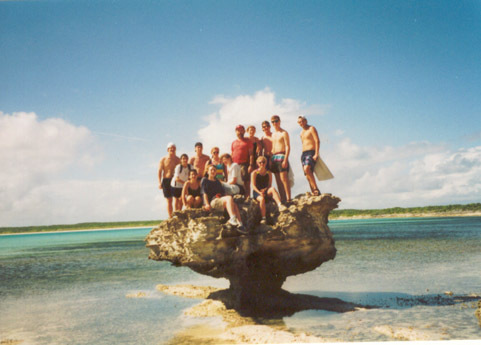 San Salvador island in the Bahamas. Photo and clues provided by Mary Jo Alfano. 1. The fold and formation shown here are named after a nearby fishing and logging town. 2. Just out of the picture to the left, a glacier hits tidewater. The glacier was named after the first professor of geology at Princeton University -- a man who has also had three mountains, one crater on the Moon and a hall on the Princeton campus named in his honor. 3. While the amount of deformation might suggest otherwise, these rocks are relatively young (Pliocene to Pleistocene). 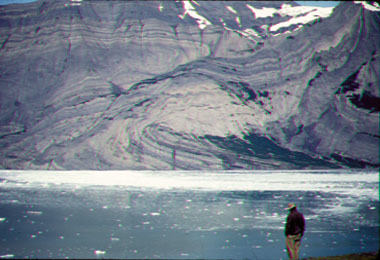 Guyot Hills, adjacent to the Guyot Glacier in Icy Bay, Alaska. Photo and clues provided by Scott Broadwell.